This article is about Atlantic cod (scientific name, Gadus morhua) which is found around all coastal areas of the North Atlantic Ocean. There is a similar fish called Pacific cod (Gadus macrocephalus) fished in great quantities around Alaska. But over here in Europe, we all think that's second best. Neither should be confused with black cod, which is a quite different and much pricier fish caught in only small quantities. Females of several fish species can lay a million or more eggs a year. But cod is amongst only a few species which can readily achieve body weights of 20 kilos or more, and these fish have a larger capacity. A big female cod can lay ten million eggs a year. Of course, most of these are simply eaten, including by cod, which is a cannibal. Nevertheless, the demographic potential is mind-boggling. And yet, as recent history has shown. we can undo it if we try. 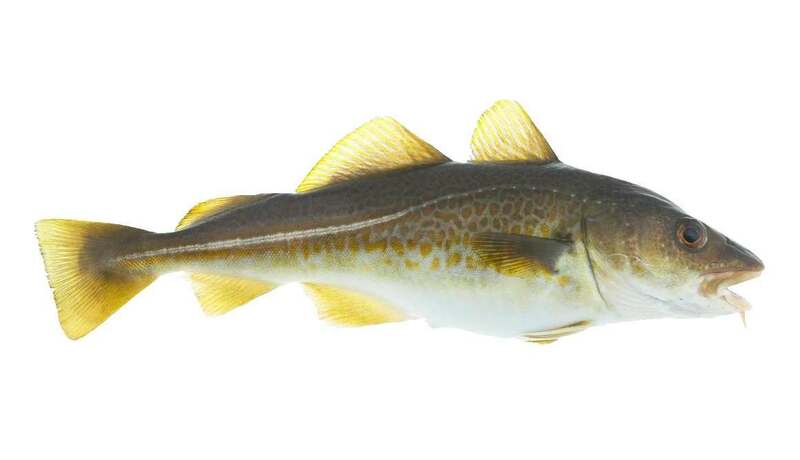 Currently, most Atlantic cod comes from Russia, Norway and Iceland. These countries have large stocks which have been well managed. For hundreds of years until about 30 years ago, there were also big cod fisheries in the North Sea and the Grand Banks off Newfoundland and New England. But these were poorly managed and now contribute less than five per cent of the supply of Atlantic cod. Since about 1066, the authorities and particularly the church were very enthusiastic about "fast days". Some churchmen urged three fast days a week. Fasting didn't mean no food - it just meant no meat... fish was allowed. So a lot of fish was required and cod fitted the bill. It was plentiful and once salted or dried could reach everyone, everywhere. It became popular. There was plenty of cod in the North Sea but by about 1400 fishermen had discovered prodigious quantities off Iceland and a hundred years later they arrived on the Grand Banks off Newfoundland where even prodigious was an understatement: "the fish is so thick that we have hardly been able to row a boat through them". For most of the last 100 years, catches of cod by European fisherman vastly exceeded those of any other species. Fish and chips, fish fingers, fish cakes, and in southern Europe, salt cod or bacalao - all the consumer's fishy hotspots were based on cod. Many still are, but over the last 50 years, fishing patterns have changed dramatically. The first factor was the establishment of 200 mile fishing limits in the 1970s. This brought to an end hundreds of years of fishing by foreign nations - especially Britain - around Iceland. The second factor was over-fishing, played out most starkly in the Grand Banks. After a century of landing about 250,000 tons of cod a year, a new generation of larger trawlers increased landings to 800,000 tons in the late 1960s. And then there were none: in 1992, the Canadian Government announced a moratorium on cod fishing (there was none to catch, anyway). This was intended to last for a couple of years to allow stocks to recover. But only 25 years later, are there some signs of a meaningful recovery. It was a similar tale in the North Sea. Between 1960 and 1980 the cod catch quadrupled to 400,000 tons then shrank to 30,000 tons by 2005. Scientists recommended a moratorium; fishermen couldn't be persuaded to go that far but did limit their catches very substantially. Eventually, in 2017, scientists determined that the stock of cod in the North Sea could sustain the amount being caught, but still the catch remains only a fraction of historic levels. 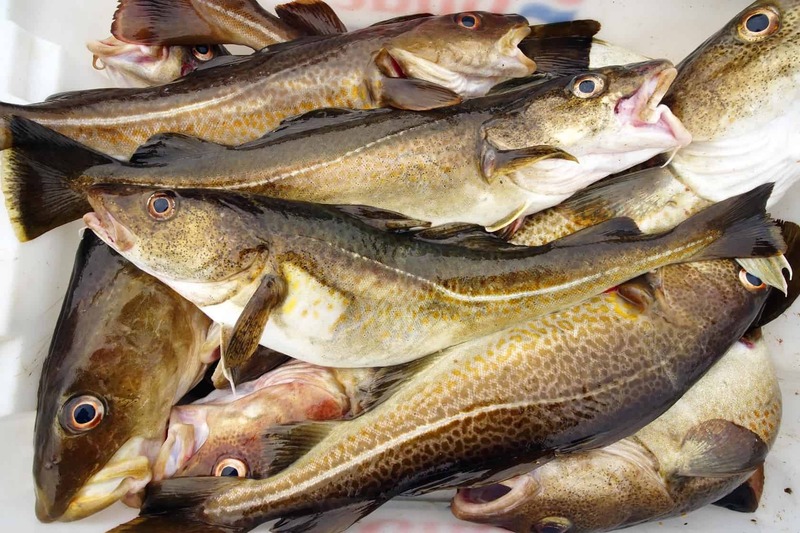 All this time however, Norway, Russia and Iceland, which had stringent sustainability policies, continued to supply cod to the UK where its popularity had never wavered. Cod-farming? It's been tried - indeed we used to sell it, but our supplier went bust. So far as we are aware, no company has been able to make it work. In truth, the economics of farming require wild cod to be much more expensive by being fished to the limit. And, touch wood, that outcome seems to have been averted. Cod is still far and away the most popular white fish* in Britain. Including fish fingers, cod in batter, breaded cod and so on, we spend £350m a year on cod - which makes us the world's biggest cod market (although our per capita consumption is well under half of Portugal's level - there, bacalao is the Christmas Day meal). Nine tenths of our cod are imported. *We spend more on tuna - mainly in cans, and farmed salmon. But in terms of traditional white fish, we like cod, cod and cod. Our mainstay cod product has always been Norwegian frozen-at-sea fillets (filleted and frozen on the trawler within hours of capture). There are various grades of frozen at sea fillets including trawled fish (caught by net) and line-caught. We always buy line-caught when available but sometimes must buy trawled fish and we cannot always buy Norwegian, in which case we use Icelandic or Russian. We sell these frozen-at-sea fillets as whole fillets. 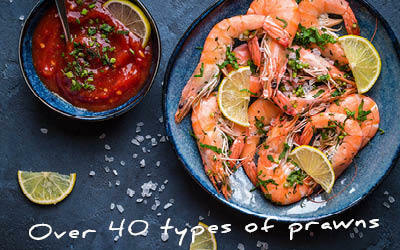 Frozen-at-sea is widely recognised to be a premium product, much more expensive than a second supply category - cod which has been landed fresh for onshore processing and freezing. We also sell fillet steaks and bullets of cod. These are from a third supply category - large fresh fillets marketed as fresh fillets. This is the most expensive form of cod, often coming from boats which have been at sea for only a day or two. We buy such fillets either from Norway, Iceland or from around our own coast, cutting them into our fillet steaks and bullets and freezing normally within a few hours of their arrival. 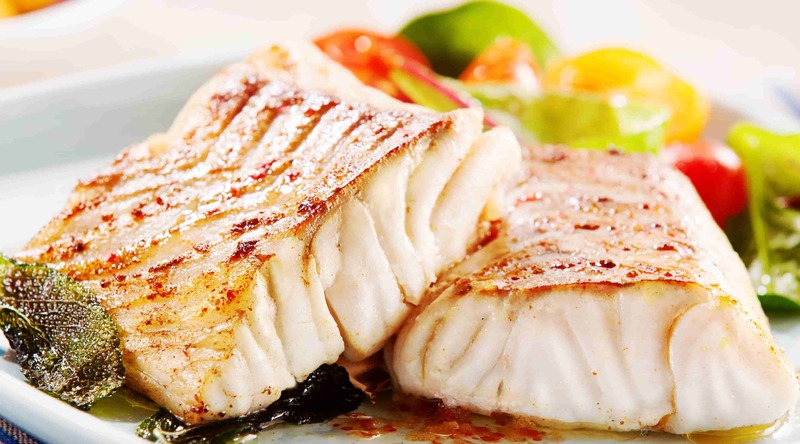 Skrei cod (pronounced skray) is special because it is super lean and very fit. It's caught in February and March when it arrives on the Norwegian coast after a strenuous thousand mile migration from the Arctic. We buy a large supply and have it available for most of the year. Most of the cod consumed throughout history was salted - literally buried in salt for a few weeks to dry and preserve it. Salt cod or bacalao could be exported even to hot countries and remain palatable for years. Salting adds an extra dimension of taste so even though refrigeration overtook salting a century ago, salt cod remains popular in many countries. This item comes in many grades. We sell a superb boneless and skinless version crafted in Scotland. Salt cod, or bacalao - how half the world eats its cod. The cod gives many products other than its basic fillets. Cod roes, cod liver, cod tongues and cod cheeks are all popular items with our customers. We also sell salt cod - or bacalao - in several forms and of course, smoked cod. Cod heads are often available on our fish heads page. They make great soup. Even committed non-gourmet types, when presented with a good large cod fillet, immediately recognise its culinary promise. A decent fillet from a large fish such as we would use at The Fish Society, comes out of the oven look-at-me white, its muscle flakes - each a mouthful-size - begging the honour of being separated delicately one by one rather than being carcrashed with a knife. It delivers a succulent and sweet yet "clean" eating experience. Cooked in good batter, you get the identical result as soon as you break that batter open. 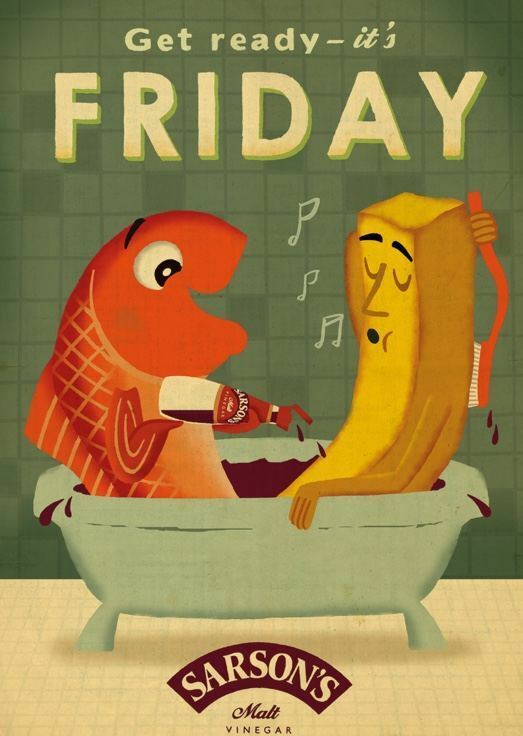 Cod does not need a sauce, but it's not going to be deterred by one, either. As long as you have a decent piece of fillet - it has to be thick - you can hit it with rich adornments. The cod will triumph. The data below are averages. Individual fish could vary by 25%, reflecting seasonal and other factors.